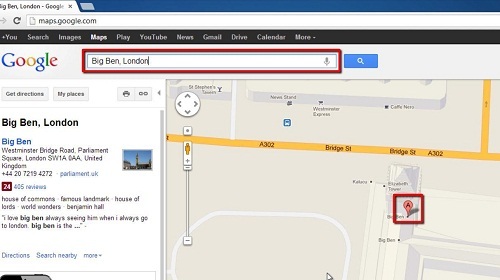 This tutorial will show you how to remove google map listing. This is a process you can’t complete yourself but you can initiate the process, which will then be reviewed by Google. Navigate to Google Maps at “www.maps.google.com” and in the search box type the name of the listing. In this example we are going to nominate “Big Ben, London” for removal. Maps will bring up the location zoomed and centered on the right and it will be labeled with the letter “A”. Right click on the “A” marker and in the menu that appears click “Report a problem”. A window will appear and from the options on the right check the box for “Place / Business closure”, then click “Continue”. A new tab will open. 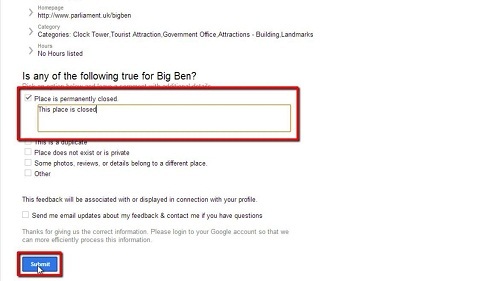 Scroll down to the heading that reads “Is any of the following true for Big Ben?”. Check the box next to “Place is permanently closed”, enter any details, and click “Submit”. 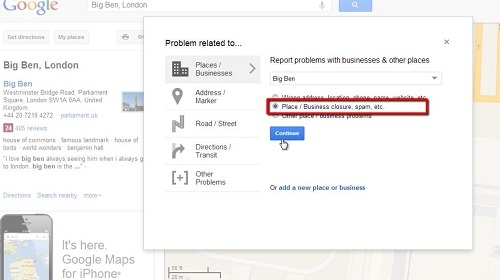 As this is just an example, and Big Ben is not closed, we won’t complete the process here, but this is how to remove google map listing.